When Germany crashed out of the FIFA World Cup 2018 in the first round, this was one picture that captured the shock and the disbelief of German fans around the world. However, the irony of the situation was not missed. 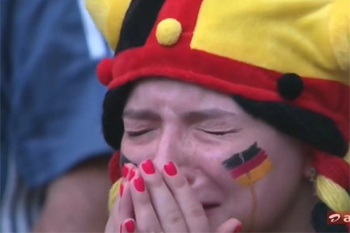 When Germany crashed out of the FIFA World Cup 2018 in the first round, this was one picture that captured the shock and the disbelief of German fans around the world. However, the irony of the situation was not missed. This trend has been repeating in four of the last five World Cups. People are now calling it the “Winner’s Curse”. Check this out. Effectively, the Winner’s Curse has proven right in four out of the last five World Cups. But that is off the point. Even for the casual observer it was quite apparent that Germany was not fully investing its heart and soul into the game. That was the crux of the matter. In fact, Germany looked a pale shadow of the ruthless well-oiled machine that trounced Brazil 7-1 in the quarter finals in 2014. While the German team will introspect the matter, let us look at some important lessons that we can glean from the shocking German loss. There is a very thin line between what is not probable and what is not possible. The last time Germany had crashed out in Round 1 was in 1938. Almost nobody gave it a thought after the passage of nearly 80 years. The lesson from the German defeat is that Black Swans can strike when you least expect them. That is why when we create an investment portfolio, it is always good to invest with a Plan-B in place. Most investors thought that the crash of 1933 will never be repeated but world markets came close to that in 2008. Always invest with a Plan-B in place. That is where Germany faltered by losing to a much weaker Mexican side 0-1 in their first game. Even in their game against Sweden, Germany was just a pale shadow of their prowess. That is also what happened to Spain in 2014 when they were trounced by the Netherlands in their first game. When you invest, do your preparation and homework before you start investing? Don’t wait under the hope that you will recover your losses in future. When it comes to investing also, well begun is half done. That is exactly what was lacking in the German camp in the 2018 season. In their three games against Mexico, Sweden and South Korea, Germany showed neither aggression nor a sense of planning and strategy. In fact, the game against South Korea was an example of sloppiness that we normally don’t associate with German soccer. The secret of success in investing lies in being aggressive and at the same time tempering your aggression with a sense of strategy. German soccer in 2014 represented exactly that! Resting on laurels is something most of us like to do and why not? You have played a hard game and deserve to take it easy. But don’t let that casualness overcome you! In the case of Germany, the resounding win in 2014 and favourable predictions almost made the Germans complacent. That is where the Germans paid a heavy price. The loss to Mexico should have woken them up but the victory over Sweden lulled them again. When you are investing, do not give too much credence to your last quarter performance or last year outperformance. Each day is a new day so take it as a new challenge. Avoid getting complacent about past victories. That is the cardinal blunder. Germans, in all walks of life, are known to be doers rather than just dreamers. In the German DNA there is a great emphasis on action. It was this action that was missing in the German game through this World Cup. They almost looked like a team that had given up on trying and were just hoping that the tide would turn their way. That is not the sign of a champion team. The same rule applies to your investing too. When you go wrong, introspect and take corrective action, even if it means taking a loss. Hoping for profits will not get you too far. Finally, we all have a German Soccer team in our portfolio. Stocks that are tough and can perform consistently. Even the best of stocks have their bad moments. If your portfolio is down, don’t lose hope. If it can happen to German soccer, it could happen to anybody. Just stick to your focus. Your portfolio will bounce back and surely German soccer will too!